To make it easy for teams to use existing projects with the new IDE, we have implemented a wizard for importing Eclipse projects into VS Code. This will generate the necessary Gradle components and load the project into VS Code. Press Ctrl+Shift+P and type "WPILib" or click the WPILib icon to locate the WPILib commands. 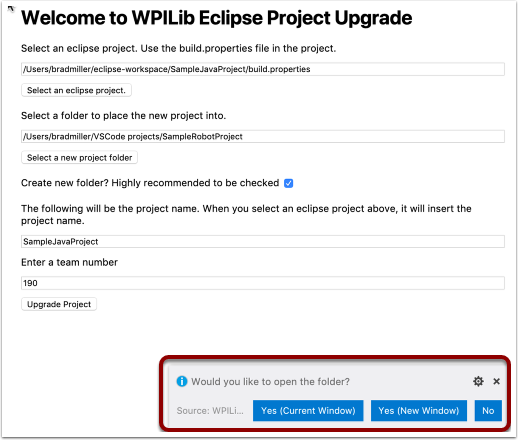 Select "Upgrade a WPILib Eclipse Project. 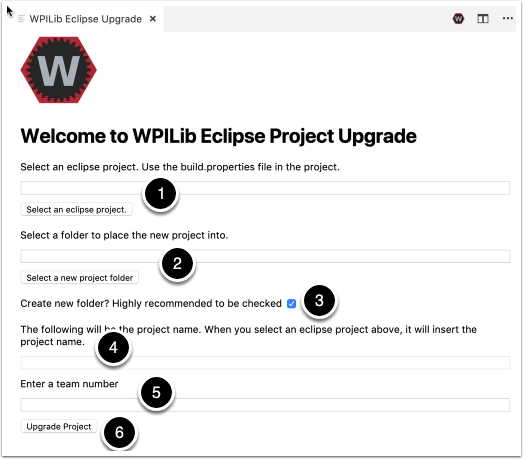 You'll be presented with the WPILib Eclipse Project Upgrade window. This is similar to the process of creating a new project and the window and the steps are shown below. Select the eclipse project to convert. Select the build.properties file in the root directory of the eclipse project. Fill in the new project folder by pressing the "Select a new project folder" button. If the "Create new folder" checkbox is checked, then the project will be stored in a new folder under the one selected in 2. If it is not checked, then the project will be placed in the folder specified. It must be empty in that case. Enter the name of the new project. Enter the team number for the creation of the project and for the robot deployment. And finally, click "Upgrade Project" to begin the upgrade. The eclipse project will be upgraded and copied into the new project directory from step 3 above. You can then either open the new project immediately or open it later using the Ctrl-O (or Command-O for Mac) shortcut.